MOTHER'S DAY BUNDLE-SPECIAL: 4 uniquely beautiful stories of life, love, and the heart of a mother. We begin our interviews (in order of appearance or last to first whichever way you start) with the people involved in the novel, THE PERFECT SOLUTION. 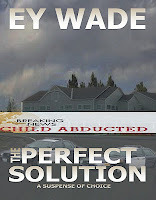 The Perfect Solution is a novel of a horrendous and unimaginable act. Through a series of mistakes that occur in the overcrowded confusion of his classroom, three year old, Brhin-Kristoffer Teddi is forced by his pre-school teacher to leave the center with a woman he does not know. The Perfect Solution is an analysis of choices made by individuals and the way those choices interweave with the lives of others. If you have a child in your life, take this survey/questionnaire as a tool on your search for the perfect solution. Author: Okay, Ms. Wall sorry it took so long. All of our bottles were gone so I had to run a floor down to get water. I’m going to have a talk with the receptionist. So, let’s get to the interview. Bertha Wall: Before we start, I just want to make it clear I didn’t give that little boy away. That silly little girl and the office worker did. AUTHOR: Yes, we know that. We also know you let a lot of things in that daycare get past you. Our main question is ‘why did you open the childcare center? What was your main purpose? Bertha Wall: To tell the truth my first thought was the money I could make without really having to work. I thought as the director I would be able to designate what I wanted done and just sit back and collect the money. I hadn’t counted on the staff being a hive of idiots. AUTHOR: Ms. Wall I have talked to a few of your past staff members and it seems you had a lot of problems in the center. Children forgotten on outings, electrocution, abuse…. Bertha Wall: Abuse? What are you talking about? Let me tell you something I don’t know who you were talking with, but it’s probably someone I fired. There was no abuse at my daycare centers and I’ll sue anyone who says so. Bertha points angrily at the camera. How dare you put this kind of thing on the air when it isn’t true. AUTHOR: What about the child whose arm was broken by that teacher? Why do you hire incompetent people? Why do you defy the law and the required child/staff ratio? Bertha Wall: I thought you were talking about sexual abuse or something. None of that is going on. When I hire people I do the required checks and hire experienced people. You can’t tell how a person will work until they are on the job. This is with any profession. You think my center is the only one with problems? They all have them. Some are just better hidden. As for the number of children in the rooms, I can’t help it when the people don’t come to work and in the meantime the children are switched from room to room until a sub comes in. AUTHOR: Is that what happened that day? From all of the reports that's not exactly what went on in the room with Ms. Franklin. Evidence shows there was utter chaos in that room, really in the entire center that day. Bertha Wall: That was a mistake…Visibly upset, Bertha closes her eyes and wipes her face with a crumpled Kleenex gripped in her fists. I’ve had enough. Tell your audience to buy the book if they want to know more. I gotta go. Bertha stands, gathers her bag and jacket from the floor and leaves the room. The story dealing with the abduction of a pre-K student from a day care center shows the necessity for more stringent safety measures to be applied to all day care centers. The characters are sympathetically protrayed and you do feel concern for their perdicament, but you just wanted to shake the people who ran the day care center and ask "What were you thinking" I would recommend this to anyone who would enjoy a well-paced suspense story. 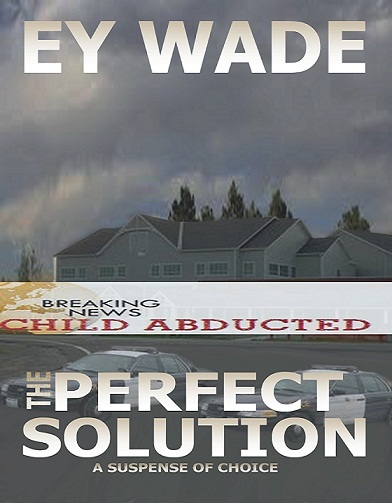 Patricia Hardy "patticake 545"
The Perfect Solution -Isn't!, PatriciaHardy "patticake 545"
The story dealing with the abduction of a pre-K student from a day care center shows the necessity for more stringent safety measures to be applied to all day care centers. The characters are sympathetically protrayed and you do feel concern for their perdicament, but you just wanted to shake the people who ran the day care center and ask "What were you thinking" I would recommend this to anyone who would enjoy a well-paced suspense story. Nook and on iPad here.